Since I haven't been doodling for ages, I decided to play safe and start with some basic patterns that I drew with a stencil (like Gabrielle Price, but mine became the focal point, no stamping this time). 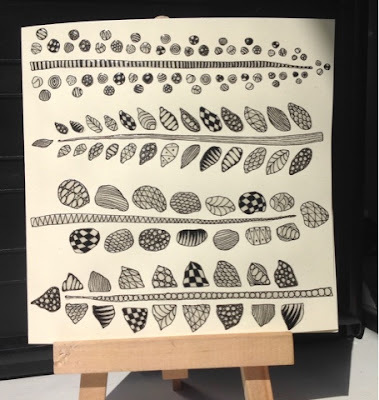 I'm posting for the Paperartsy doodles-challenge and the Country View May challenge (use a stencil). 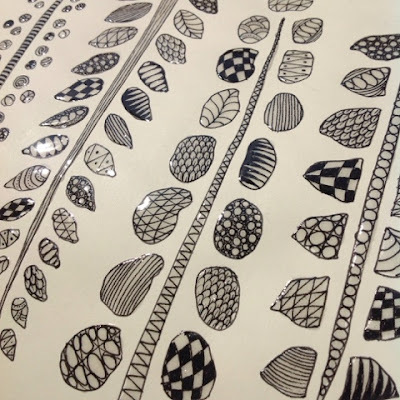 I'm not much of a doodler, but after seeing Zentangles here and there, I did spend a trip (about a year ago) checking through and practising tangles that I found on the Tanglepatterns.com website. the step by step guides were easy to follow, and keeping that in mind I dared myself to "just do it". The stencil I used is from The Crafters Workshop, I drew the outlines of the ferns on an ivory 6x6 cardbase. I started doodling with checkers and stripes and circles, counting that I'd turn to the tanglepatterns page when I ran out of ideas... but actually I didn't have to: the more I did, the easier it became and all of a sudden all the leaves where full :) I'm burning to try some Jofy or Lin Brown flowers next! I used a Micron pen (0,3mm) for the doodling and added Glossy Accents over the patterns to give a finishing touch.